For the last two weeks I’ve been harvesting watermelons! I grew two varieties this year. Moon & Stars is an heirloom, named for the yellow splotches on its skin. The leaves are also spotted, making them look sick, but for Moon & Stars the spots are normal. I’ve grown Moon & Stars several times and we love it. The flesh is crisp, very juicy, and sweet without being cloying. The seeds are numerous and large – great for seed spitting contests. 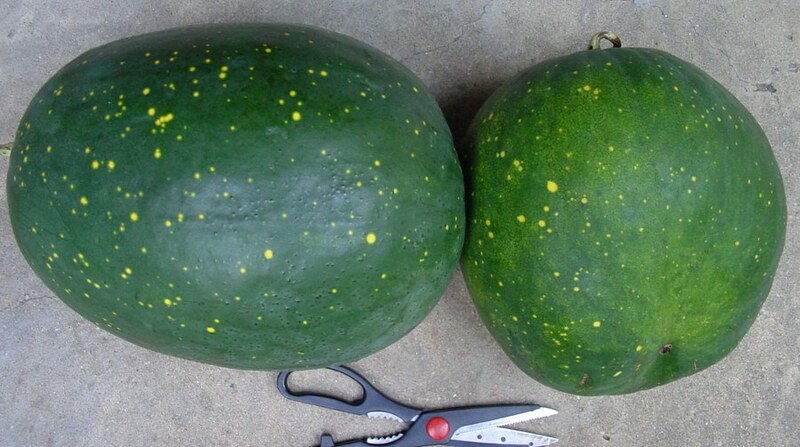 Moon & Stars Watermelons, left 18 pounds, right 11, scissors for scale. 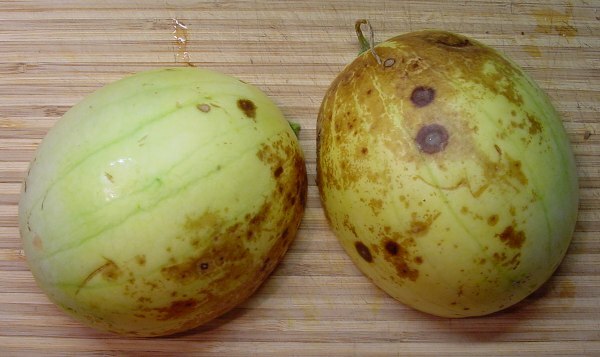 The Moon and Stars harvest totaled 67 pounds – each plant provided one big fruit plus there were a couple smaller melons. The vines run all over, with the melons setting about 8′ out on the vines. I found two well hidden in the dried bean patch, one in the corn, and another under the tomato cage. Faerie watermelon. Note the thin rind. The blemishes were only skin deep. We ate both melons. if harvested earlier they would have been prettier and perhaps crisper. The rest of the garden has also been producing: carrots, beets, chard, beans, peppers, and tomatoes. I harvested the last ears of corn Tuesday. Most of my tomato plants at the community gardens are almost dead from Septoria and i’m ripping them out but my plants at home are still looking fairly good. And the winter squash harvest has only just begun. But that will be a story for another day. A great looking harvest this week. 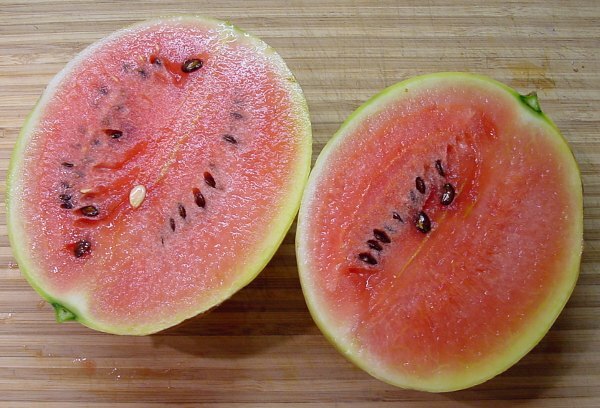 We love home grown melons!! Our watermelons have been done for a couple of weeks but we are picking Crenshaw Melons now and if the weather holds we should still get another 6 or so!! Sometimes your weather seems similar to ours, but then you get your melons so much earlier. This summer you’ve had a lot more heat than NYS. Nice watermelons! I’ve never successfully grown one, but I do have one this year that I am trying to determine when to pick. It really is a tough call! You should take a look at this post http://ourstoneyacres.com/picking-the-perfect-melon . Even after getting all the signs, I like to wait a few more days, but clearly I waited too long. The melons look wonderful. Well the ones at the top at least. The bottom ones aren’t nearly as photogenic. IT’s been years since I grew Moon and Stars. As I remember it was a tasty watermelon. Your’s look great! Great melon harvest. The moon and stars is my favorite. Nice melon harvest, I didn’t grow any fruits this year.